To be the best in business enterprise always providing customers with innovative opportunities to advertise their name, products, logos and other mass communication concepts through continuous R&D in cutting edge technologies and enable them to derive optimum mileage from high levels of visibility. To provide business enterprises and advertising industry with custom made high quality innovative inflatable medium of widest possible diversity that is capable of generating optimum mass communication effect whether installed indoor, outdoor, in the air or on water using cutting edge technology for Total Customer Satisfaction. At F.O.A.M.S, we see to it that we provide valuable and reliable services, best quality products, at a fair price. 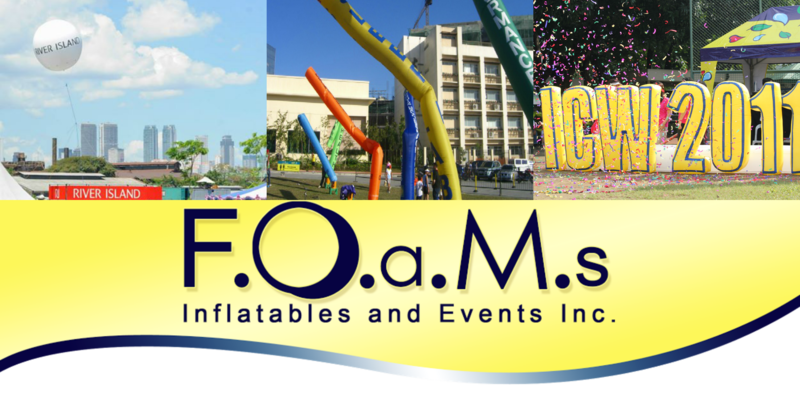 F.O.A.M.S Inflatables and Events Incorporated’s primary objective is to value commitment and mutual relationship to our client in its professional way. We will remain competitive in the advertising industry as well in providing talents for promotional/ special events Thus,F.O.A.M.S Inflatable and Events Inc. believe that we can contribute to the fast growing industry of advertising.As our trade name says, we will be your FIRST OPTION!